The Thunder-Bots pose with their First Place Gracious Professionalism award the team earned at the Ohio State Championship. 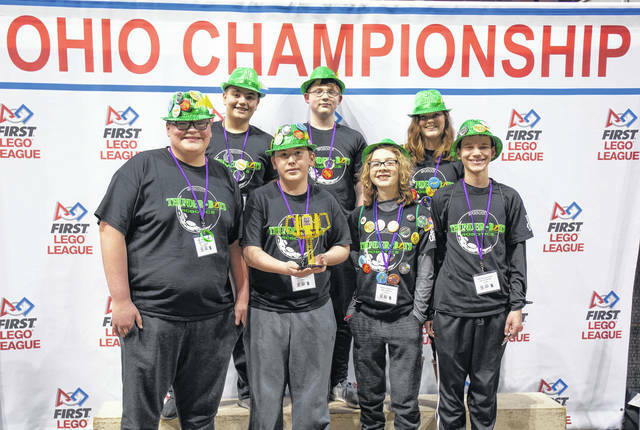 COLUMBUS — The Thunder-Bots Robotics team is a FIRST LEGO League (FLL) team comprised of seven 7thgraders – Carson Stone, Owen Franks, Jacob Hobbs, Ryan Fitzgerald, Erin Kelsey, Jacksen Cooper, and Ben Cope. The team is based in Englewood and is sponsored by Caterpillar, Inc. The Thunder-Bots recently competed at the West Carrolton Regional tournament where they earned First Place Grand Champions award. The team then advanced to the Wright State district tournament where they earned the Project Research award. They were selected to advance to the Ohio State Championship to compete against 60 of the best teams from around the state. At the Ohio State Championship the Thunder-Bots were one of six champion teams and earned the First Place Gracious Professionalism award. This award recognizes a team whose members show each other and other teams respect at all times. They recognize that both friendly competition and mutual gain are possible, on and off the playing field. This award is a very high honor as FLL is founded by this key principle. The Thunder-Bots were selected to advance to the Mountain State International Invitational and will represent Ohio as they compete with teams from around the globe. The FIRST Core Values are the cornerstones of the program. They are among the fundamental elements that distinguish FIRST LEGO League from other programs of its kind. By embracing the Core Values, participants learn that friendly competition and mutual gain are not separate goals, and that helping one another is the foundation of teamwork.